A while ago, I had plans of making a Muse Patterns outfit. 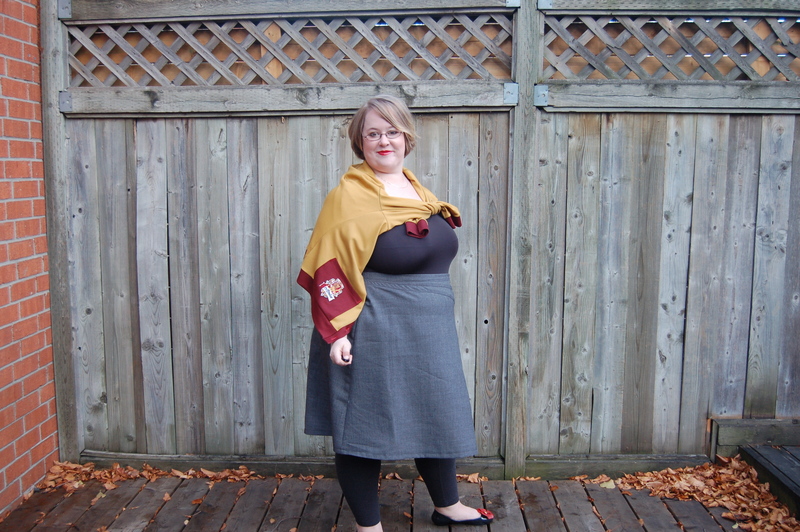 Then Kat posted the Muse Loves Merino contest and I had to create an outfit for that! 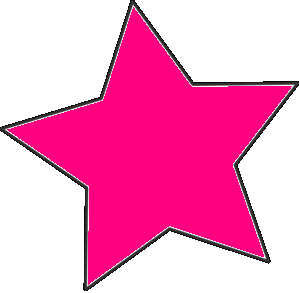 Check out the contest. There is still time to create something for it since it closes on November 30. 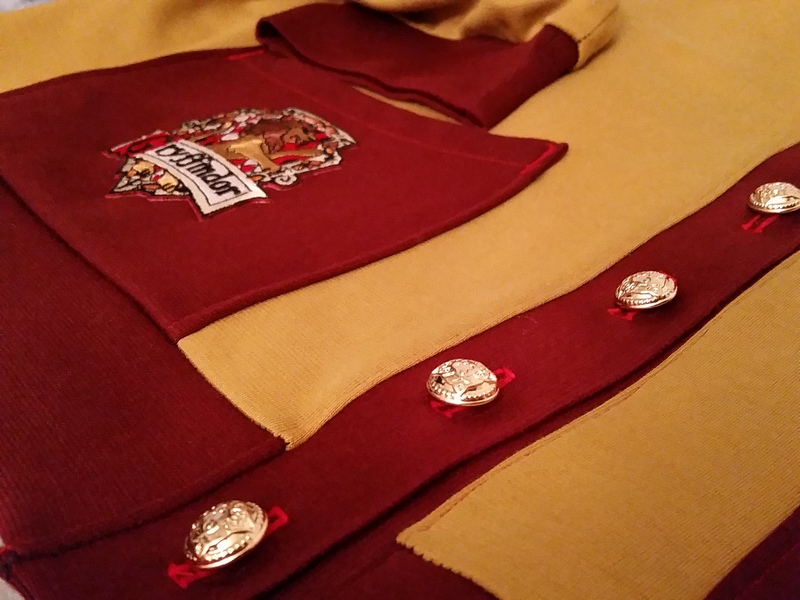 Eventually, my outfit evolved into a Gryffindor uniform. 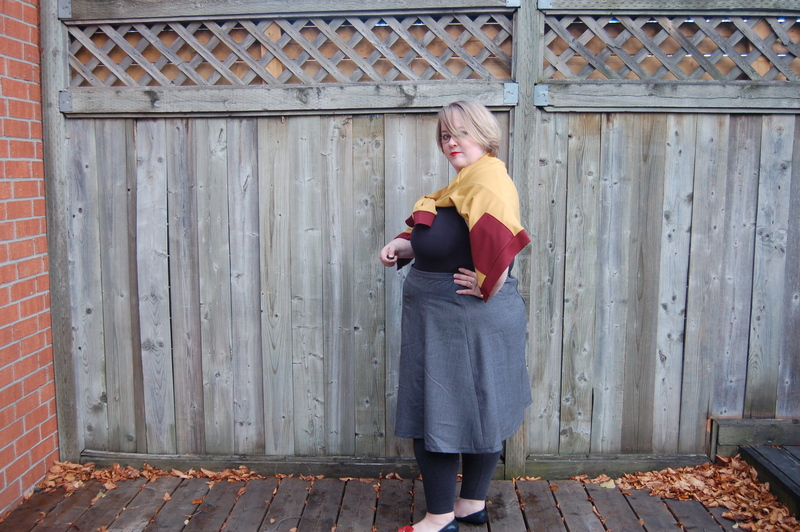 As soon as I picked the colours of the Sophi cardi, it was set: gold and red. 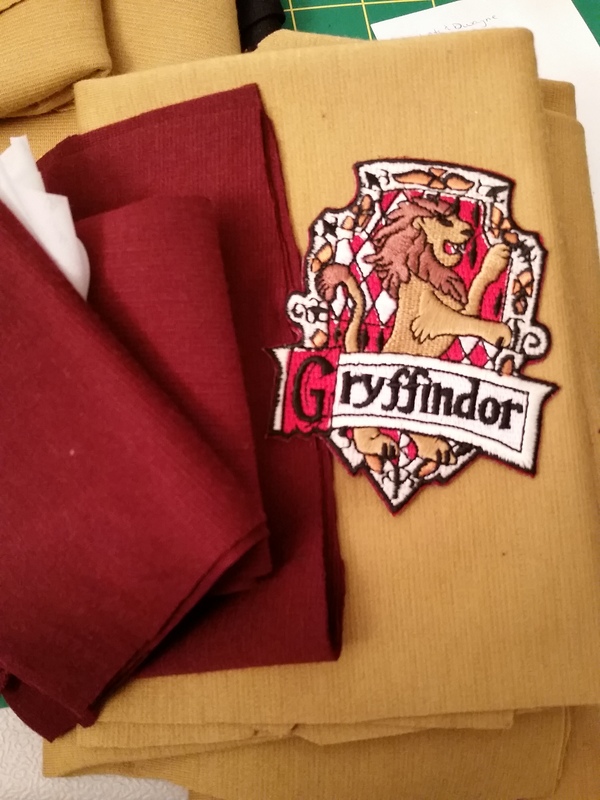 I ordered my Gryffindor iron on patch from YourPatchStore on etsy and I decided to make a grey wool Tahi skirt to be reminiscent of a school uniform. I should do the disclaimer: Both of these patterns I received for free from Muse Patterns, but all the opinions and geekery are my own. 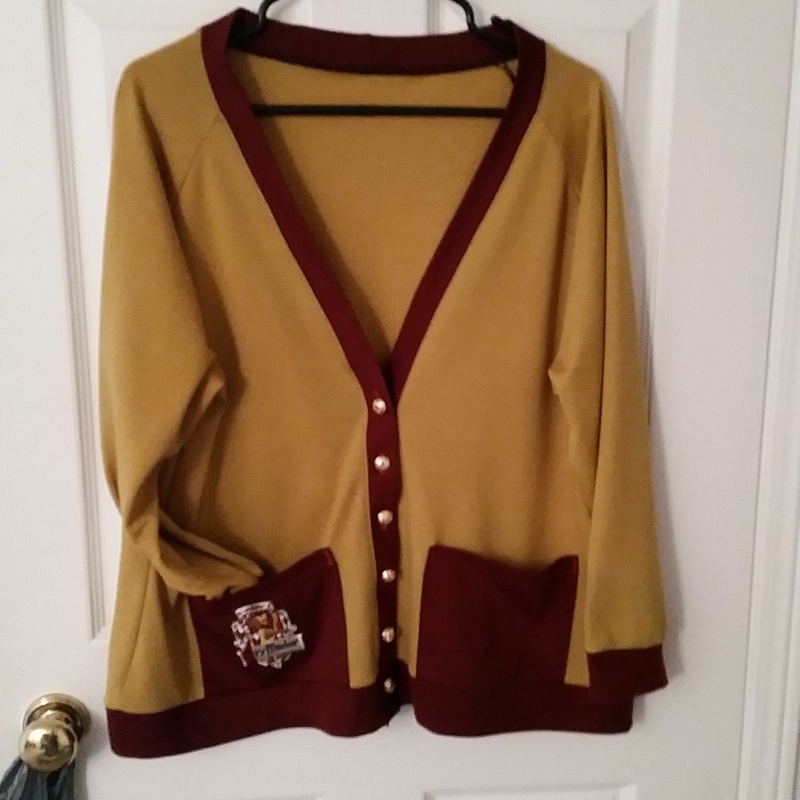 I also had the perfect gold buttons in my stash for the cardigan. Both the skirt and the cardigan were extremely easy to make. The pdf pattern was a breeze to put together. I love that Kat added a feature to the pdfs where you can print just your size. The pdf is layered and you can choose what layers to print. It makes for a really clean pattern once it’s all put together. I never grade between sizes with Kat’s patterns. I’m pretty firmly at the top end of her sizing. Both skirt and cardigan were easy to sew. The only issues I ran into were on the skirt with the paneling. My grey wool was very lightweight and prone to shifting around a little during construction. I had to sew one of the panels again to get it right. I loved the zipper construction for the skirt. It was so easy to follow and probably my best lapped zipper insertion yet! Of course I forgot to take a picture of it! I usually handpick my zippers, but I did this completely on the machine. Same with the waistband: I usually hand sew, but was able to do it on the machine really nicely. I always find I have a lot more control and a neater finish with hand sewing, but the instructions for the skirt really guide you and make sure the finish is great with the machine. My only critique of the cardigan is that the neckband in the v-neck version could use shortening. It doesn’t seem to provide enough negative ease to make sure it doesn’t get loose at the neck and flip up. It might have been my mistake, though, as my fabric piece wasn’t big enough to make it all one piece and I have a seam at the center of the neckband. I’m a huge fan of Muse Patterns and often test for Kat. It didn’t work out to test for either of these patterns. One was released just before my wedding this summer and the other while my cat was ill. I am so glad I got to make them both, especially in such a nerdy way! Here’s my photoshoot! Excuse the wrinkly skirt. I ironed it and sat down once to put my shoes on and well…. I decided not to iron again. In terms of fit, I think the skirt is slightly long for me, but I decided not to shorten it and lose the panel flares. I like the shape of the skirt, but I definitely prefer a circle skirt or a dirndl skirt shape to the a-line; I love fuller skirts and find they flatter my shape a lot more. I think the basic A-line would work really nicely in a suede with a shorter length, since suede holds it’s shape nicely. I might try this in the future since I have some suede. I love the cardigan. Although, I do think it would look better with pants instead of the high-waisted skirts or dresses that I normally wear. I also wear cardigans open more than closed like this so that tends to be a little better. Pros: Lovely construction and instructions for the zipper, panels, and waistband. Went together beautifully. Cons: Nothing against the pattern, but if you are making in a slippery fabric use something like spray starch to stabilize the fabric for those corners in the panels. Make again? : Absolutely. I think that suede one needs to happen! Pros: I love the pockets. A cardigan with pockets is a hug bonus. The raglan sleeves went together really nicely and fit well unlike a lot of other patterns I have used with raglan sleeves. Cons: The neckband was perhaps too long. I’m not 100% on whether this was my mistake or the pattern’s. 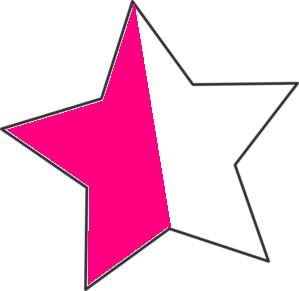 I will make it again and decide whether I will give the half star back for that. Make again? : Absolutely. My bestie commented on the picture on Instagram and went crazy. I will be making her one for her birthday this year. 1) You are a nerd and I love you. B) Your hair looks amazing. cat) That cardigan is totally fun. I agree the skirt would probably work a bit better shorter. I’d love to see it in suede! My hair is finally not at a weird length. I might get a cut after Christmas to even it out, but it looks nice at this length so far. BTW–I checked out the Sophie Cardi on Muses’s page, and the photos there seem to show that the neckband is a little floppy/loose So I think it’s how it’s drafted, not you? Easy enough to fix the neckband issue, but I might email Kat and chat about it. I also saw another person on IG with the same issue. Let us know, because I just finished my first Jenna and I think the neckband was a bit too long as well. Tge cardigan looks comfy! And so well made. Love the nod to HP.